Researcher Danswell Starrs with a carp caught and tagged in the Murrumbidgee. Carp may be said to be water-sheep: herbivorous, gregarious, of a contented mind. The proposed release of a carp herpesvirus has raised many questions from the public around how it will work, will it work and what will happen with all the dead carp. Rivers of Carbon supports the release of the virus, as it is estimated that in some of our rivers 85% of the biomass is made up of carp. We don’t know if the virus will be released, but we feel there is a strong likelihood of it occurring in 2018 or 2019. Our message to people is that for our native fish to take the opportunity presented by ‘knocking off’ carp, we need habitat ready for them to survive and thrive. In December 2016 we had a Carping at Christmas even to talk about our native fish and the possible release of the virus. Dr Matt Barwick is heading up the carp herpes release project and is known as the ‘Carponator’. He provided a great talk outlining the research into the possible release of the virus, as well as answering concerns people raised about the virus. Dr Luke Pearce talked about our native fish and the opportunity the release of the virus could mean for them ‘bouncing back’. Luke also showed how to fillet and cook carp, something that is done everywhere else in the world except Australia. Copies of a carp cook book that is free to download were also given away. Remember to log any catch of carp at Feral Fish Scan – a new community website for collecting evidence of feral fish. Feral fish (also called ‘pest fish’) cause enormous damage to our rivers and native fish populations. If you have seen or caught feral fish in your local area, record the details to help identify feral fish hotspots across our catchment. Species such as European carp, Redfin perch, Goldfish, Gambusia and Oriental weatherloach are found in many rivers, but exactly where they occur is poorly known. These species are directly impacting on our native fish and aquatic fauna in many ways, including the spread of disease/parasites and predation on the young and eggs of native species. You can help by recording sightings of pest fish in the FeralFishScan community mapping facility throughout your catchment area. This data will then be available for everyone to see and use. As a partner in the Upper Murrumbidgee Demonstration Reach we are supporting efforts to understand more about carp behaviour and optimal management measures. To learn more about the species, thirty-one tagged carp have been released into the upper Murrumbidgee River at Scottsdale (near Bredbo) and Murrells Crossing (downstream of Cooma). The tagged carp are marked with a long yellow tag near their dorsal fin. These carp are implanted with electronic tags so their movements can be tracked to tell us how carp move up and down the river system. We are asking recreational fishers to please RELEASE tagged fish if caught and report details to Bush Heritage Australia. A reward will be given for making a report. Please take photos if possible. Carp movement is being studied as part of the Upper Murrumbidgee Demonstration Reach Carp Research project in partnership with Bush Heritage Australia, NSW DPI (Fisheries), Capital Region Fishing Alliance and the NSW Recreational Fishing Trust. The UMDR Carp Reduction Strategy identifies carp as a key management issue for implementing recovery of native fish populations in the upper Murrumbidgee. 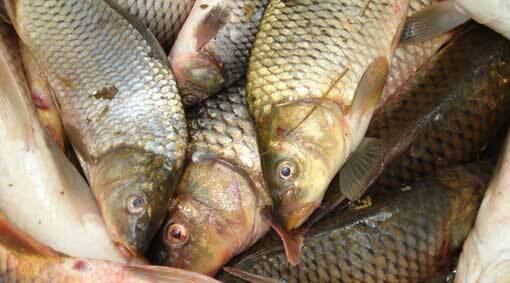 Carp are recognised as one of Australia’s worst aquatic pest species. In our region we know little about the carp lifecycle and where they breed, yet this information is vital to better manage the impact of carp on native fish and river ecosystems. In lowland regions, carp research has shown that carp breeding is concentrated in large, shallow wetland areas from which lowland river systems are populated. However, in upland river systems such as ours there is an absence of large, river-connected breeding areas, yet carp are still prevailing throughout the system. There is anecdotal evidence that suggest that carp may actually be breeding in riverine systems of the upper Murrumbidgee. This project aims to address these key knowldge gaps to enable better carp management actions that support native fish recovery. In addition to raising awareness about the carp herpes virus, we are also trailing a new carp trap design in our Rivers of Carbon Upper Murrumbidgee project that is showing some promise. The design is new and works with the carp’s behaviour of burrowing into banks and beds to source food. 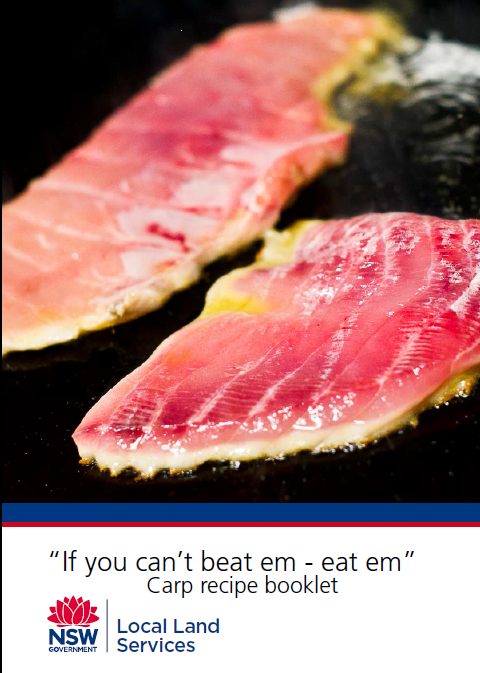 This is something our native fish do not do, so it means they are not attracted to the food in the trap that requires the fish to push against a flap to access it. We are currently trialling the trap to ensure that by-catch of platypus and turtles is not a problem. For more information about the UMDR Carp Research project go to: www.upperbidgeereach.org.au or contact Antia Brademann (UMDR Facilitator) on 0429 778 633. In our RipRap edition entitled ‘Habitat makes Fish Happen’ Matt Barwick wrote an article about the recent budget allocation of $15 Million towards enabling carp impacts to be reduced through the release of the carp herpes virus. Click on the image below to read the full article.